Where do I use my TH Baker voucher code? Click on the offer you wish to use form NetVoucherCodes and follow the link to TH Baker. Browse to find products you would like to purchase then select ‘Add To Bag’. Click ‘Add To Bag’ then paste your code into the box titled ‘Enter a Coupon Code’. Then, press ‘Add’ and ‘Checkout Securely’ to complete your purchase. TH Baker has been providing fine jewellery and watches since 1888 and is now one of the most popular independent jewellers in the whole of the UK. With over 30 stores nationwide and a huge online boutique, there are more ways than ever before to buy stunning, affordable jewellery for either yourself or a loved one. Head to the jewellery category on the TH Baker website and discover an array of stunning pieces. Shop via collection, type, metal, and brand and find everything from charms to pendants. Discover stunning diamond rings, earrings, bracelets and pendants with different gemstones and cuts and surprise that special someone with a piece of luxury jewellery that they can cherish forever. Shop for watches from prestigious brands like Gucci, Omega and Pre-owned Rolex and accessorize your wrist with a stunning piece. If you’re planning on getting engaged or have a wedding coming up, you can shop for jewellery specialised for these occasions; choosing your style, metal and brand, with plenty of options available for both men and women. As well as all this you can also browse through gifts for Christmas, birthdays and other such occasions, a pre-owned section with lots of secondhand discounted jewellery and an impressive outlet section. For help and inspiration head to the TH Baker blog, or check out the number of useful guides available around the site. TH Baker understands that finding the right product can be tough, so to help, they’ve created a Diamond guide to assist you in your buying, a size guide to ensure you’re buying pieces with the right dimensions and a precious metal guide to help clue you up on your gemstones. As well as all this, they also offer an engravable jewellery service, allowing you to make your jewellery even more personal, as well as a watch specialist section and engagement and wedding planners to help with the jewellery buying and gifting part of the big day. As a certified Pandora retailer, TH Baker stock genuine Pandora jewellery including rings, charms, bracelets and earrings. Shop via type, collection, gender, material, price, colour, stone type, theme and birthstone and find the perfect pieces that are great for both everyday use and for special occasions. Shop for classic Pandora keepsakes like the popular birthstone rings, the silver charm bracelets and seasonal charms as well as new pieces and collaborations with Disney, Essence and Rose. Shop for men’s and women’s watches from top name brands such as Michael Kors, Emporio Armani, Radley, Casio, Rotary and much more at TH Baker. Select your watch via product type, collection, brand, gender and price and specify your dial colour, strap colour, strap type, case material, water resistance, watch movement and stone set. Whether you’re looking for a prestigious timepiece crafted from noble materials or a fashionable watch in this season must-have colour, TH Baker has all of your needs catered for, which includes pre-owned models too. If for any reason, you are unhappy with your purchase, or it does not meet your requirements, you can return it in its original condition and packaging, within 30 days of the date you received it and TH Baker will issue an exchange or a full refund for the price you paid for the item. Email: sales@thbaker.co.uk or use the contact form. 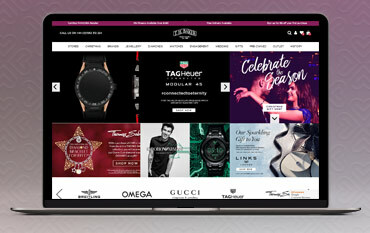 With over 125 years of experience in the watch and jewellery industry, TH Baker continues to provide affordable, stunning jewellery through its online website and in a number of high street stores across the UK. Shop online with a TH Baker discount code and enjoy savings on everything from earrings to watches to bangles, and enjoy greatly reduced prices that you won’t find in-store. With top brands like Pandora, Links of London, Thomas Sabo and Swarovski, you’ll find all the jewellery you could ever need for a great price at TH Baker.